Transits of Venus are rare and historically important astronomical events. 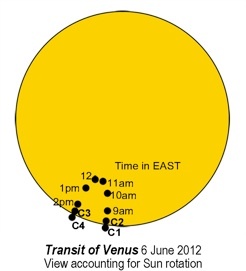 Most of Australia is well positioned to witness the next transit of Venus on Wednesday 6th June 2012. The Surveying and Spatial Sciences industry in association with the Astronomical Association of Queensland (AAQ) is providing resources to enable students to participate in a re-enactment of a great scientific endeavour and in doing so learn valuable lessons in science, mathematics, history and geography. Teachers can access student activities and lesson plans from the Resources tab. Activities are designed to assist with teaching about the transit in the classroom. These cover aspects of Science and Mathematics and there is information on how they relate to the new National Curriculum. One example is to use freely available software to simulate the transit, investigate the transit circumstances for your geographic location, or any other location on the Earth, record the results and later observe the transit to compare results to observation. There are links to other websites which have activities and lesson plans related to the transit. There are also links to websites with information about the transit and related subjects. For those without an alternate safe viewing option or if there is bad weather on the day or those not fortunate to be in the viewable area of the transit, a live video of the whole event will be broadcast on the project website above. Coverage will start from 8am, Eastern Australian Time (GMT +10 hours) and will conclude some seven hours later after Venus has completed its transit. The event will be covered by a number of high quality specialist telescopes in Australia to ensure the best possibility of getting a live feed should cloud hamper efforts and cameras will be switched on a regular basis to compare the different views through our broadcaster’s telescopes. For a more feature packed view of the event, click the LiveStream above (when activated) for a larger view, where users can join in with live chat too! Links are provided on the website to sites which describe the method of calculation of the Astronomical Unit (AU), AU calculators which use data from the transit of Venus in 2004 and calculators that allow input of your observation of the 2012 transit for your own calculation of the AU. See computing Astronomical Unit above. A Transit of a planet occurs when the planet passes directly between the Earth and the Sun so that as seen from the Earth, the planet appears to pass across the face of the Sun. Transits can only occur with planets whose orbit is between that of the Earth and the Sun; that is, Mercury and Venus. A transit of a planet is similar to a solar eclipse but the planet appears to be much smaller that the Moon so it cannot cover the Sun and looks like a small black disc slowly crossing the Sun. How often do Transits occur? Transits of Mercury occur quite regularly (with about 13 each century) but they are difficult to observe due to the very small apparent size of Mercury. Transits of Venus are much rarer and are more interesting due to the larger apparent size of Venus and due to their historical connections. Transits of Venus occur in a pattern that repeats every 243 years with pairs of transits eight years apart separated by gaps of 121½ years and 105½ years. Venus and the Earth are aligned in the same direction out from the Sun about every 584 days (this is called in conjunction), however a transit does not occur each time because Venus’s orbit is usually above or below the Sun in the sky. Jeremiah Horrocks was the first person to successfully predict and observe a transit of Venus in 1639. Observations of the transits of Venus became scientifically important when in 1716 Edmund Halley proposed that observations from different locations on the Earth could be used to determine the distance between the Sun and the Earth (called the Astronomical Unit); and the scale of the solar system could be subsequently determined by applying Kepler’s third law of planetary motion. At that time there was great uncertainty about the size of the solar system and by extension the size of the universe. Many scientific expeditions were sent around the globe to observe the 1761 transit and there was great competition between nations to solve what was called “the noblest problem in astronomy”. Unfortunately difficulties in accurately timing the transit led to conflicting results, and consequently an even greater effort was mounted for the 1769 transit. Combined results from the two transits produced a better understanding of the solar distance, but further refinement was undertaken in later transits. The 1769 transit has a vital historical connection to Australia. Lieutenant James Cook was dispatched to Tahiti on HMS Endeavour to observe the transit. After a successful observation he was directed to search for the “great south land” thought to exist in the South Pacific Ocean and following that search he discovered and charted the east coast of Australia. Scientific expeditions were spread across Australia to observe the 1874 transit and again for the 1882 transits, with many of these successfully recording the event. 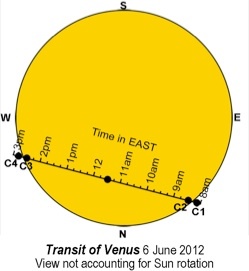 For the transit of 6th June 2012, Venus will take about six hours and a half hours to travel across the face of the Sun. Venus must be above the horizon for the transit to be visible. Australia is one of the best places on Earth from which to observe the transit as the entire transit will be visible from eastern and central Australia. The transit will have started before sunrise for those observing from Western Australia. The predicted path of Venus across the Sun’s disc is shown in the diagrams above for locations on the east coast of Australia. Venus will travel in a straight line across the Sun. However, because the Sun appears to rotate as it crosses the sky, Venus will appear to move in an inverted “U” shape when viewed from Australia. Timing for the transit is given in terms of “contacts”. First Contact (C1) Venus first touches the Sun. Second Contact (C2) Venus is just inside the Sun on the way “in” (ingress). It is now possible to predict the timing of the transit contacts with great precision, because we now have accurate information on the distance to the planets and the Sun. When early astronomers were trying to measure the distance to the Sun, it was necessary to time the transit contacts as accurately a possible. However they had great difficulty with this because of what has become known as the “black drop” effect. 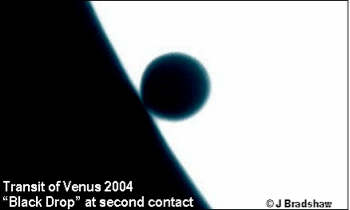 This effect occurs immediately after second contact and again immediately before third contact when Venus appears to be connected to the Sun’s limb (edge) by a narrow dark zone. The black drop effect is thought to be due to image blurring from atmospheric distortion and equipment diffraction coupled with solar limb darkening. The original benefit of observing transits of Venus was to assist in determining the Astronomical Unit. Later on, transits were used to examine Venus’s atmosphere using spectroscopy. Currently there is a great deal of scientific effort directed towards the search for exoplanets (planets outside the Solar System) and planetary transits across distant stars are the main method used to search for them. 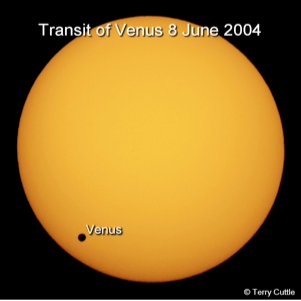 The 2004 and 2012 transits of Venus are providing a valuable benchmark and comparison with a known planet transiting a known star. Never look directly at the Sun or you may cause serious and permanent damage to your eyesight. Damage can occur without any feeling that there is something wrong as there are no pain receptors in the retina and the damage may not become apparent for some time. There are several safe methods of observing the transit. 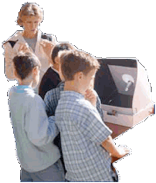 A SolarScope is a purpose made projection device ideally suited for groups of people to observe the transit. It works by projecting an image of the Sun onto a screen and it is the image that is viewed. Following the instructions, you can not look directly at the Sun. The transit can be safely viewed on the internet on webcasts. The transit will be broadcast live on this page, see above. Astronomy is the oldest of the natural sciences dating back to ancient Chinese and Babylonian civilisations. It can be defined as the science that deals with the universe beyond the Earth. Surveyors’ interest in astronomy is very much a practical one as they, unlike the astronomer with a scientific interest in the stars, is chiefly interested in how they can make use of the stars for the purpose of their survey requirements. Navigators, explorers and surveyors have used astronomy for determining, by astronomical observations, the positions of points on the Earth (latitude and longitude). Early surveyors, not only had skills in bush craft, navigation and mapping, but they also required knowledge of mathematics and astronomy in addition to an understanding of the land and its potential. Surveying skills were an essential component of early transit of Venus expeditions. It was often necessary to put more effort into the accurate geographic positioning of the observing location than into actually observing the transit and it was often the case that a person with surveying expertise would complete the mathematical analysis of the observations. Over the years, the work of surveyors using astronomy has been greatly simplified by instrument improvements and more accurate timing techniques. The need for the practical application of field astronomy in surveying and exploration has now declined as greater use is made of earth satellites (Global Positioning System or GPS) for determining location. Transit of Venus, Australia 2012 is a joint educational project of The Surveying and Spatial Science Industry, Astronomical Association of Queensland (AAQ), Science Teachers Association Qld (STAQ), contributing Teacher and Surveyor Volunteers Australia wide. The Transit of Venus Project Management Committee is a group made up of Surveyors, Astronomers and Teachers dedicated to the advancement of Science, Maths, History and the promotion of Surveying as a career of choice in our schools, through the observation of our natural world and the study of our Australian heritage in science and exploration. Financial assistance from the sponsors listed below is gratefully acknowledged. All the information and images in this web site are protected by Creative Commons Copyright unless otherwise noted. Copyright partly to AAQ, SSSIQ LSC, STAQ. Whilst the authors of this website have used all care in the collation of the material published on this website it contains opinions of the Authors and it is published as an information source only. The Authors make no warranty or representation regarding the accuracy or suitability for any purpose of the information provided. The information is provided solely on the basis that readers will be responsible for making their own assessment of the matters discussed herein. The reader accepts the risk of any use of such information, and should verify all relevant statements and information. The Authors do not accept liability to any person for the information provided in this website or incorporated into it by reference or for loss or damages incurred as a result of reliance upon the material contained in this website.